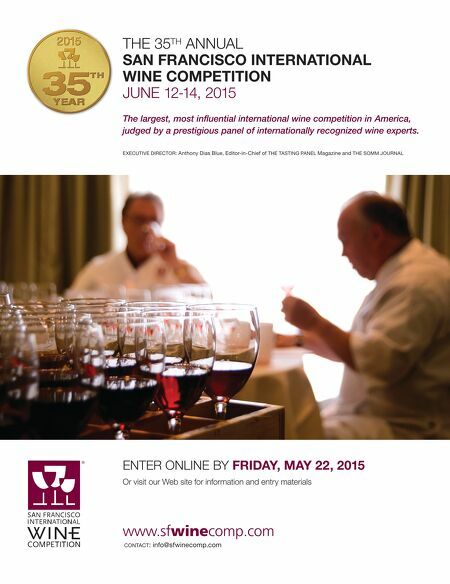 20 / the tasting panel / april 2015 SAN FRAN INSIDER F or the maker, wine requires patience; it seems to mark time at a different pace than much of the world around it. Imagine a chef who had 30 tries in as many years to master a recipe or a musician who plays one performance a year for three decades to master a symphony. For the casual consumer, however, wine is, more often than not, immediate gratification. 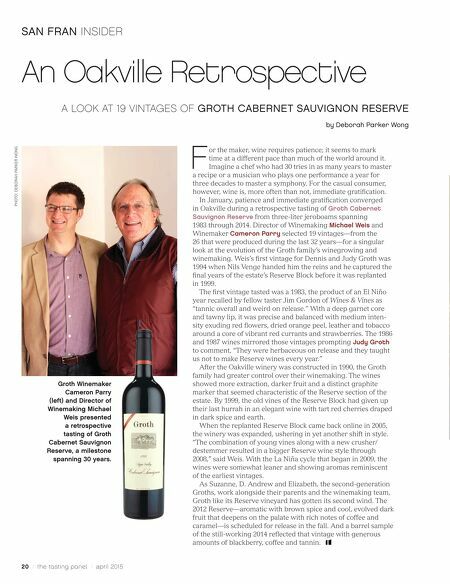 In January, patience and immediate gratification converged in Oakville during a retrospective tasting of Groth Cabernet Sauvignon Reserve from three-liter jeroboams spanning 1983 through 2014. Director of Winemaking Michael Weis and Winemaker Cameron Parry selected 19 vintages—from the 26 that were produced during the last 32 years—for a singular look at the evolution of the Groth family's winegrowing and winemaking. Weis's first vintage for Dennis and Judy Groth was 1994 when Nils Venge handed him the reins and he captured the final years of the estate's Reserve Block before it was replanted in 1999. The first vintage tasted was a 1983, the product of an El Niño year recalled by fellow taster Jim Gordon of Wines & Vines as "tannic overall and weird on release." With a deep garnet core and tawny lip, it was precise and balanced with medium inten- sity exuding red flowers, dried orange peel, leather and tobacco around a core of vibrant red currants and strawberries. The 1986 and 1987 wines mirrored those vintages prompting Judy Groth to comment, "They were herbaceous on release and they taught us not to make Reserve wines every year." After the Oakville winery was constructed in 1990, the Groth family had greater control over their winemaking. The wines showed more extraction, darker fruit and a distinct graphite marker that seemed characteristic of the Reserve section of the estate. By 1999, the old vines of the Reserve Block had given up their last hurrah in an elegant wine with tart red cherries draped in dark spice and earth. When the replanted Reserve Block came back online in 2005, the winery was expanded, ushering in yet another shift in style. "The combination of young vines along with a new crusher/ destemmer resulted in a bigger Reserve wine style through 2008," said Weis. With the La Niña cycle that began in 2009, the wines were somewhat leaner and showing aromas reminiscent of the earliest vintages. As Suzanne, D. Andrew and Elizabeth, the second-generation Groths, work alongside their parents and the winemaking team, Groth like its Reserve vineyard has gotten its second wind. The 2012 Reserve—aromatic with brown spice and cool, evolved dark fruit that deepens on the palate with rich notes of coffee and caramel—is scheduled for release in the fall. And a barrel sample of the still-working 2014 reflected that vintage with generous amounts of blackberry, coffee and tannin. An Oakville Retrospective A LOOK AT 19 VINTAGES OF GROTH CABERNET SAUVIGNON RESERVE by Deborah Parker Wong PHOTO: DEBORAH PARKER WONG Groth Winemaker Cameron Parry (left) and Director of Winemaking Michael Weis presented a retrospective tasting of Groth Cabernet Sauvignon Reserve, a milestone spanning 30 years.